Zhao Dunhua is Peking University Boya Chair Professor. 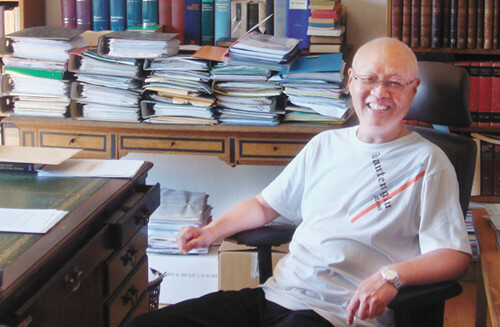 He was born in Jiangsu Province in 1949 and obtained a doctoral from the Catholic University of Louvain in Belgium in 1988. His studies range from Western philosophy, Christianity to comparative philosophy and ethics. Zhao’s major works include A History of Western Philosophy and One Thousand and Five Hundred Years of Philosophy in Christianity and Dialogues of Philosophies, Religions and Civilizations in the Era of Globalization. Innovation of philosophical theories cannot depart from the discipline’s history. Nowadays, Chinese scholars are expected to seek fundamental communication with the global academy while taking into account both the needs of humanity as a whole and domestic circumstances. In this way, a system of philosophy and social sciences with Chinese characteristics will take shape. In a recent interview with CSST, Peking University Boya Chair Professor Zhao Dunhua presented his views on philosophical studies and China’s research exchange with foreign counterparts as well as how science will shape human minds and morals. CSST: Contemporary Western research on philosophy has been “the Other” of the discipline in China, inspiring students to explore questions and theories. However, domestic research on traditional Chinese philosophy and culture have been too reliant on Western categories, principles and methodologies, but the situation is improving. Zhao Dunhua: The concept of “the Other” really matters. Western philosophy is “the Other” of Chinese philosophy. Why do we need it? It is a mirror that reflects not only the differences between Western and Chinese disciplines but also the similarities. It measures the advantages and disadvantages of Chinese philosophy. When conducting the comparison, we need to decide whether we stress differences or similarities. Tang Junyi held that the issue needed to be tackled from three stages. First, people should seek common ground amid differences. Then, huge differences should be discovered based on common ground. Finally, great harmony can remain among different groups. In addition, what should we see in front of the mirror: our shortcomings or advantages? The correct method is to learn from other’s strong points to offset our weaknesses. You mentioned category, principle and methodology. In terms of category, Chinese scholars have never imitated their Western counterparts and they chose instead to transform the Western categories to fit into Chinese philosophical academy. Scholars, such as Jin Yuelin, Feng Youlan, He Lin and Mou Zongsan, have created a broad range of categories for Chinese philosophy. When it comes to methodology, we learned from the Western studies, but I consider it a benign academic interaction. For example, Mou Zongsan reinvigorated Chinese philosophy through an encounter with Immanuel Kant’s ideas, thus proposing many categories such as Substance of Mind and Substance of Human Nature. As for guidelines, most established Chinese philosophers draw lessons from the Western philosophy despite the huge differences between the two sides. Xiong Shili is a modern Chinese philosopher who laid the foundation for the neo-Confucianism in China’s mainland in the 20th century. His works reflect the bedrock of traditional Chinese philosophy in the facets of category, language and approaches. However, he agreed with the Western guidelines. CSST: For a long time, Chinese scholars placed greater emphasis on the history of philosophy over theoretical innovation. But in recent years, there has been a strong push to reinvigorate philosophical theories. What’s your view? Zhao Dunhua: In the 80s and 90s, some people made distinctions between thinkers and scholars as well as philosophers and scholars who study history of philosophy. Such work still matters today. Knowledge provides the basis for ideas while ideas clarify the goal of knowledge. This relationship also applies to philosophy and history of philosophy. They should be integrated with each other. I proposed three research modes concerning philosophy and history of philosophy. The first pattern considers theories as the discipline’s history, but it is not substantial enough. In another, which has become popular recently, people discuss a particular person, idea or fragment and reorganize these parts, which can be seen in the tendency of fragmentation. Such research is aimless in terms of philosophical theories. I found it a trend to draw conclusions from history. Most successful theories in the world are based on history of philosophy. They interpret documents and texts with a clarified scope, goal and method, thus leading to a number of creative achievements. CSST: I notice the tendency to integrate analytical philosophy with the continental philosophy in recent philosophical studies in the West, and this tendency appeals to many scholars both in China and abroad. What is your idea about this tendency? Zhao Dunhua: I would like to talk about this from my personal experience. I started my philosophical career by studying analytic philosophy, and my dissertation is “A Study of the Relationship Between Wittgenstein and Russell.” The training that I received through studying analytic philosophy contributed greatly to my philosophical career after that. For example, I found it difficult to grasp the viewpoints of medieval philosophy, which typically features rich literature and complex argumentations. When studying the history of philosophy from the Greek philosophy to the contemporary Western philosophy, I was obligated to clarify so many questions, threads of ideas and concepts. I believe that my experience studying analytical philosophy has helped me a lot. There was a time when analytic philosophy stood in opposition to continental philosophy. Now, continental philosophy-particularly German and French philosophy- tends to adopt some methods of analytic philosophy. Analytic philosophy emphasizes sophisticated argumentation and the construction of theories, but it does not pay enough attention to the text and history of philosophy. Continental philosophy, on the other hand, pays great attention to the text and history of philosophy but not the clarity of its language. Most texts of modern German and French philosophy have this problem. By applying the methods of analytic philosophy to analyzing and arranging these texts, we are able to clarify their argumentation. The integration of analytic and continental philosophies is also an illuminating idea for the studies of Marxist philosophy in China and Chinese philosophy. CSST: You have just mentioned the relationship between philosophical study and writing the history of philosophy. As we know, the modern Chinese study of Western philosophy is actually an integral part of modern Chinese philosophy. In addition, modern Chinese philosophy also contains the study of ancient Chinese philosophy and Marxist philosophy. What’s your opinion about the entire history and logic of contemporary Chinese philosophical study? Zhao Dunhua: This also has been my concern for a long time. I have always advocated dialogue among native Chinese philosophy, Western philosophy and Marxist philosophy. This is still what I propose now. I do not think that these three philosophies can be integrated. However, I do believe conversation among them is highly necessary, conforming to the trends of development of philosophy since the dawn of the 20th century. The trend of development of philosophy in China since the 20th century can be summarized as “a transition from ancient forms of philosophy to its modern forms.” During this process, either Marxist philosophy, traditional Chinese philosophy or the dissemination of Western philosophy in China, all follow this trend. This tread is basically the “localization of Marxism in China,” the “modernization of traditional Chinese philosophy” and the “contextualization of Western philosophy.” These three “-izations” are not three distinct threads. They intersected with and confronted each other around the New Culture Movement in the 1910s and 1920s. The interactions among these three currents grew more frequent and notable in the 1930s and 1940s. In the four decades since China’s reform and opening up in 1978, the relationship between these three currents has become even closer, although divergences, debates and conflicts still exist. However, within this thread, conflicts and debates are probably necessary means towards reconciliation. Personally, I believe the communications among traditional Chinese philosophy, Western philosophy and Marxist philosophy, if they continue and further develop, will help actually construct a modern form of Chinese philosophy and find Chinese philosophy a proper role among all the philosophies in the world. CSST: As a philosopher, what are your understanding for the future impact of science on humanity? Zhao Dunhua: Science offers many new topics for future philosophy and creates huge room for its development. We need to regard interdisciplinary and applied disciplines as our research and teaching approaches, such as experimental philosophy and embodied neuroscience and consciousness. The concept of embodiment was proposed by Merleau Ponty. Many Chinese studies now touch upon body-even traditional Chinese philosophy is no exception. However, these studies are biased because they only pay attention to texts and history of philosophy while failing to connect with neuroscience. The involvement of neuroscience and embodied consciousness would greatly promote philosophy and science. The moral issues about bioscience are another question. We must consider its moral consequences in terms of human relationships and identity as the field becomes so advanced that it can clone humans or replace a human brain. Universal moral norms should be adopted to tackle such issues. Robotics and artificial intelligence also present problems with regard to moral policies. Currently, aesthetics is mainly pertinent to theoretical and artistic history. Its future will be bright by involving technology and industrial design. Besides, philosophy will embrace promising development if we continue to innovate philosophy and nurture talent.